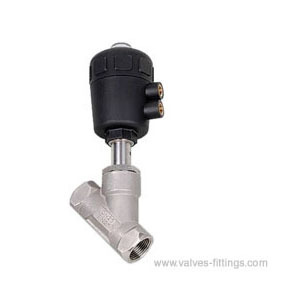 AV-5AS angle seat valve is a pneumatic valve. It is widely used in food and chemical processes, sterilization machines, high pressure sterilizers, dry-cleaning machines, clothes dryers and beer equipment, especially in steam piping systems and production lines. Size available: DN10-1/2" to DN65-2 1/2"
End connections: threaded, BSP / BSTP / NPT, clamp, flange or other upon request. NO / NC / AA pneumatic head with or without position sensor and top controller available. 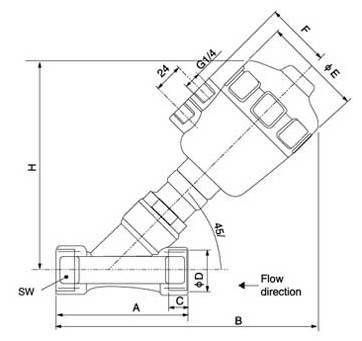 The operating principle of AS angle seat valve is the same as the check valve. However, the Y-shaped valve body equipped with pneumatic actuator expands the flow cross section of the valve chamber. This makes the fluid steadier and increases the flow rate by 30%. Meanwhile, the flow direction of medium is changed, and smaller pneumatic actuator can be equipped.